Trimethyltin (TMT), an organotin compound considered a useful tool to obtain an experimental model of neurodegeneration, exhibits neurotoxicant effects selectively localised in the limbic system and especially in the hippocampus, which are different in the rat and in mice. In the rat hippocampus, we investigated the expression of aldehyde 4-hydroxynonenal, a major bioactive marker of membrane lipid peroxidation, heat shock protein (HSP) 110/105 family members, markers of oxidative stress, and the neuroinflammatory marker cyclooxygenase-2 after TMT-intoxication at various time points after treatment. 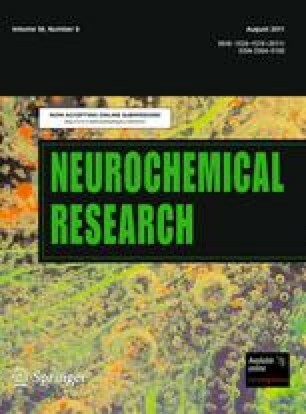 Our data show that TMT-induced neurodegeneration in the rat hippocampus is associated specifically with oxidative stress and lipid peroxidation, but not with HSP expression, indicating species-specific differences in the neurotoxicity of TMT between rats and mice. We would like to thank Prof. N. Miani for useful discussion and Mr D. Bonvissuto and Mr K. Baltazar Del Carmen for excellent technical support. This work was partially supported by funds from Università Cattolica del S. Cuore to F.M, M.C.G. and V.C.